Laura Murlender´s work addresses personal and collective themes of disappearance, transition and memory. They are reflected in layered oil and mixed media paintings and works on paper. Her exhibition From Darkness to Light based on her experiences as a “disappeared” under the former dictatorship in Argentina was held at the Yeshiva University Museum in NY (2007). Murlender graduated from the Bezalel Academy of Art and Design, Jerusalem and the École des Beaux-Arts in Paris. She has been an artist in residence at Makor / Steinhardt Program in New York. She was recently awarded the Memorial Foundation for Jewish Culture Grant. 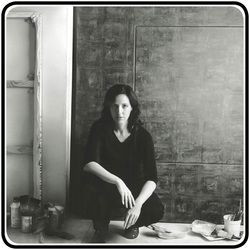 She also received the Helena Rubinstein Foundation First Prize; the America-Israel Cultural Foundation Grant; the French Government Grant; the Samuel First Prize in Visual Arts - Canada and the photography awards: Brenner - Ilford and Agfa. Her works are part of public collections such as the Derfner Judaica Museum and Yeshiva University Museum, New York; the Bass Museum of Art, Miami; MACLA Museum of Contemporary Art, La Plata, Argentina - and in numerous private ones. Murlender's works have been shown in solo and group exhibitions including the Centre Pompidou and the Grand Palais, Paris; Yeshiva University Museum, Kouros Gallery and the Argentine Consulate in New York, Recoleta Cultural Center and Galeria Vasari in Buenos Aires; Museum of Contemporary Latin American Art, La Plata, Argentina and MOLAA - Museum of Latin American Art, Long Beach, California. Reviews about her exhibitions have appeared in The New York Sun, ArtScope.net, Art Daily, The Boston Globe, Art Collector Planet, La Nación Newspaper and Buenos Aires Herald among others.